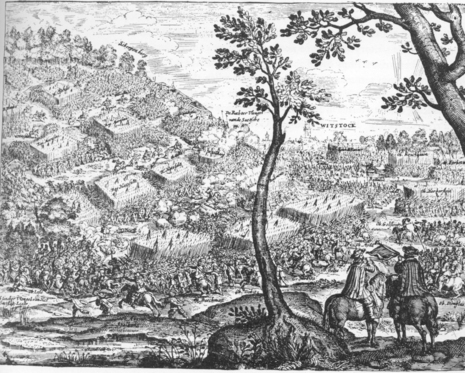 The Battle of Wittstock was fought on 24 September (Julian calendar) or 4 October (Gregorian calendar) 1636, between a Protestant Swedish army and an alliance of the Holy Roman Empire and Saxony. The Holy Roman Emperor in Vienna, with his Saxon and Roman Catholic allies, was contesting Northern Germany with the Swedes. The German main army was screening the Swedish army behind the Elbe while a smaller army under General Klitzing was overrunning Brandenburg. Baner crossed the Elbe at a surprise march and the Swedish army intercepted their opponents in the hilly landscape filled with forests slightly south of Wittstock. The German army was equal in strength to the Swedish army, but at least 1/3 of it was composed of Saxon low quality units, and the Swedish artillery was also considerably stronger, so German commanders conducted a defensive strategy all the time. The Germans decided to wait for the Swedes on a range of sandy hills, Scharfenberg; with a part of the front with six ditches swiftly dug to ensure victory and a wall of linked wagons. Their commanders waited for some time for the Swedish troops to appear on the open fields before their front. Instead, the Swedish army was turning the German left flank moving behind the cover of a link of hills. The Germans were forced to regroup their frontlines and set up a new front. The battle was joined by small forces detached in detail to secure the hills, the Swedish had problems with the moving up of reinforcements through marshy ground, while the Germans had to reform its entire line. However, Baner had detached one-fourth of its army under King to a long detour around the German right flank, those forces arrived just in time, before Baner main force was overwhelmed by the German army. King's cavalry overrun a screen of 1.000 German musketeers and attacked the German army by the rear. Attacked on two fronts and having lost all the artillery, the Germans retreated under the cover of dusk. In September, 1636 the Swedes took the offensive again. Banér moved from his camp at Werben and down the Elbe towards Naumberg. 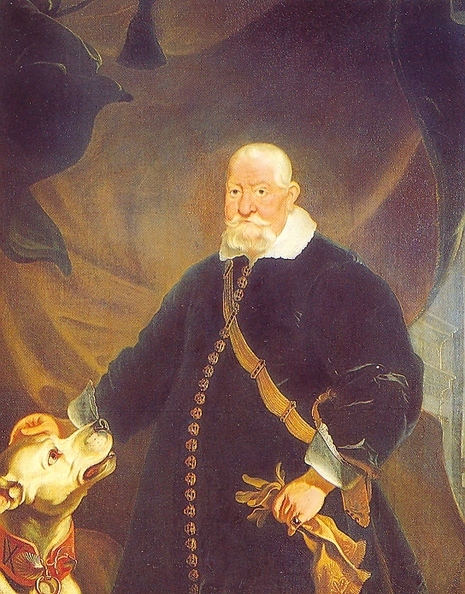 A joint Saxon-Imperial force moved to stop the Swedes, whom they met at Wittstock in Brandenburg. On 4 October, 1636, the Swedes inflicted a crushing defeat on their more numerous foes. 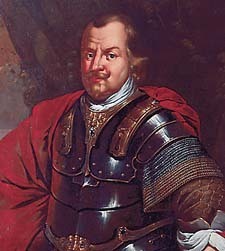 The Swedes under Wrangel promptly occupied the remainder of Brandenburg, while Banér’s forces pushed as far as Eisenach. The Swedes were once more out of their Baltic redoubt. Banér dispatched Wrangel against Brandenburg in an effort to overawe the Elector into alliance, as Gustavus had done five years before. The effort failed, and Georg-Wilhelm drew closer to the Emperor and began to raise an army of his own. Banér and the Swedes moved south into Saxony, besieging Leipzig. The siege failed, and in January, 1637 they fell back on Torgau.